Health centers are experiencing greater demands on their services as health reform implementation proceeds, often necessitating growth and operational transformation. As their role as key providers of primary care increases, health centers need to assess their current performance and develop strategies for improvement. Prior Capital Link studies have provided insight to health centers, Primary Care Associations, and other stakeholders about financial and operational trends. This analysis furthers our knowledge by examining the operating models, strategies, and practices of high-performing health centers to better understand the factors that work for and against the co-occurrence of strong clinical performance and financial sustainability. Do health centers that excel in providing high-quality patient care have better or worse financial results than other health centers? What are the characteristics of health centers that achieve both high-quality care and strong financial results? What do high-performing health centers do differently or better than their peers? 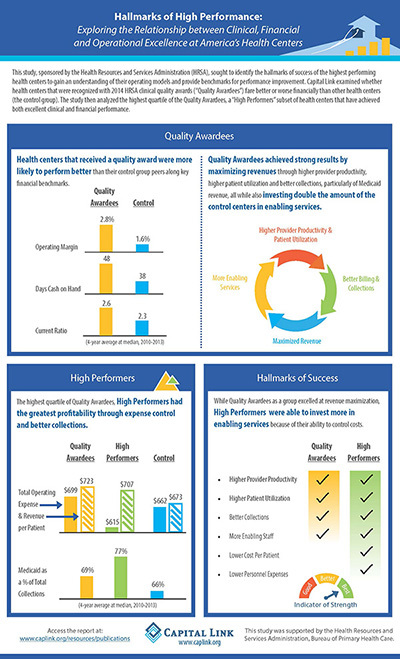 The results of this analysis show that it is possible for health centers to reach quality targets while also performing well financially. Quality Awardee health centers achieve key quality targets and invest more in enabling staff and services, but are also able to produce strong financial results through revenue maximization, efficient medical care teams, and higher utilization through positive engagement with patients. The data further indicates that the highest performers have a greater ability to control costs—in particular, staffing costs—even though they are more heavily staffed with generally higher-cost physicians. Key findings are illustrated in our infographic. Access a free download of the complete report at www.caplink.org/resources/publications.